Your dentures are an investment in your oral health and appearance that can last for fifteen years or more if they’re expertly made and properly cared for. 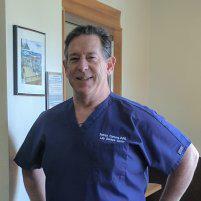 Patrick Carbone, a denturist with over 30 years’ experience, considers you a member of his Lilly Denture Center family in Olympia, Washington. He and his wife, Carol, make you feel welcome as he takes your impressions and fabricates your dentures in his state-of-the-art, in-office dental laboratory. After your high-quality, long-lasting dentures are ready, Patrick teaches you how to maintain them properly. If you have dentures requiring care or repair, contact Patrick and his family team by phone or the online booking tool. How do I clean my dentures after a meal? You need to remove and clean your dentures after every meal and before you go to bed at night. Between meals, you rinse your dentures with warm water, making sure to dislodge any food particles that may adhere to them. Only use warm water, not hot water. Because your dentures are made of acrylic, hot water could warp them. Protect your dentures while cleaning by holding them over a sink that’s been filled with water or lined with a towel. Be sure to hold them firmly without gripping. Before you reinsert your dentures, rinse out your mouth with water or brush your gums gently with a soft brush. Taking care of your oral health helps preserve your dentures’ integrity, too. Can I clean my dentures with toothpaste? Toothpaste contains abrasives that can erode and damage the acrylic on your dentures. If you want to clean your dentures more thoroughly than just a rinse, you can use liquid hand soap or liquid dish detergent. Brush gently with a soft-bristled brush and be sure to rinse thoroughly. You can use an ultrasonic cleaner in addition to brushing. How do I clean my dentures at night? Every night, you should place your dentures in a denture-cleaning solution. Over-the-counter denture cleaners come in tablet, liquid, or powder form. Leave your dentures in the solution overnight. If you don’t soak your dentures when not in use, they could become brittle. If your dentures have metal braces or clips, ask Patrick about the best type of solution in which to soak them. Regular water might tarnish the metal. Can I fix my dentures if they break? Attempting to fix your dentures may damage them permanently and injure your soft tissues. Lilly Denture Center has an on-site, state-of-the-art laboratory where Patrick fixes your dentures on the same day you drop them off. When should my dentures be relined? Your dentures should be relined every three to five years to accommodate age-related bone and gum loss. Patrick can reline your dentures on the same day with an appointment. Contact Patrick and his family at Lilly Denture Center to learn more about denture care. You can also schedule a reline or repair online or by calling the office.